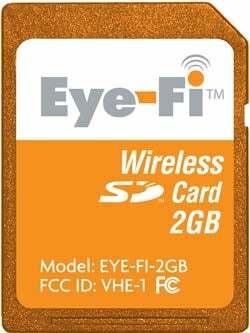 Remember the Eye-Fi? That's the SD card that adds auto-uploading Wi-Fi capabilities to any digital camera. Now the company has teamed with Nikon to add extended Eye-Fi functionality to the first camera on the market, Nikon's D60. When the Eye-Fi is inserted into the D60, the D60 will "automatically adjust its power timer settings to ensure that photos upload effortlessly for sharing and storing." So it looks like camera manufacturers are getting a say in how to optimize the uploading from the camera, which can only be good for end users. The Eye-Fi service will also be adding another photo sharing partner, Nikon's my Picturetown. Having major camera manufacturers working to support this third party device, even at these more rudimentary levels, is a big break for the Eye-Fi. And if you're still confused about what the hell this thing does, don't miss our review here. It's sort of a "why not" device that can rid your life of USB cables—if you don't mind spending a little bit extra on an SD card.